BACK ON MARKET, SELLER DIDN'T PERFORM, ALL INSPECTIONS DONE, AND CLEAR! Meticulously cared for home by original homeowner. 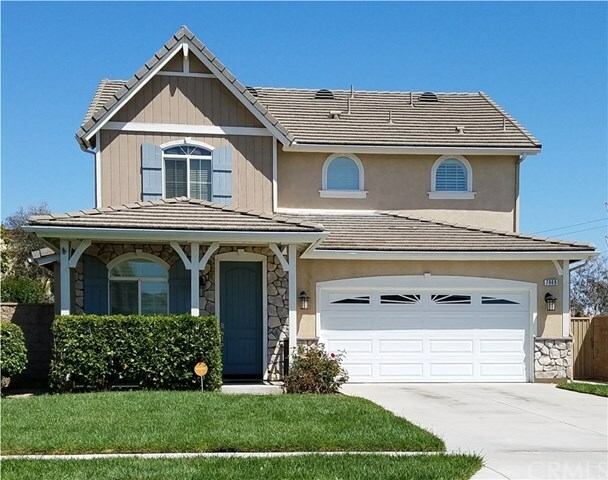 Walking distance to Victoria Gardens, in the highly acclaimed Etiwanda School District. You'll be drawn right away to this home by it's beautifully detailed exterior and landscaping. Enjoy the mountain views from your front porch in this quiet, desirable neighborhood.You enter into the formal living room and dining room accented by plantation shutters and attractive paint scheme. 4 bedrooms include a downstairs bedroom with adjacent full bath, perfect for the grandparents or guests. Kitchen is beautifully equipped with rich Beechwood cabinets, granite counter tops, all stainless steel appliances, walk in pantry and center island with breakfast bar.Kitchen opens up to the spacious family room with sliding glass door out to the backyard. Backyard has great outdoor living spaces which includes covered patio with custom retractable awning. In addition to the 3 upstairs bedrooms, there's a loft which provides flexible space for kids play, game room or just relaxing with a good book. Large master bedroom with plantation shutters has master bathroom featuring a dual sink, separate tub and shower and long walk in closet with window for natural lighting. Separate laundry room downstairs has lots of additional cabinets for storage. Built in desk/work station off the family room. 2 car garage with 2 steel storage racks.Many energy efficient features. NO HOA FEES.